Versatile and beautiful, hollies (Ilex spp.) provide a four-season framework for many gardens. 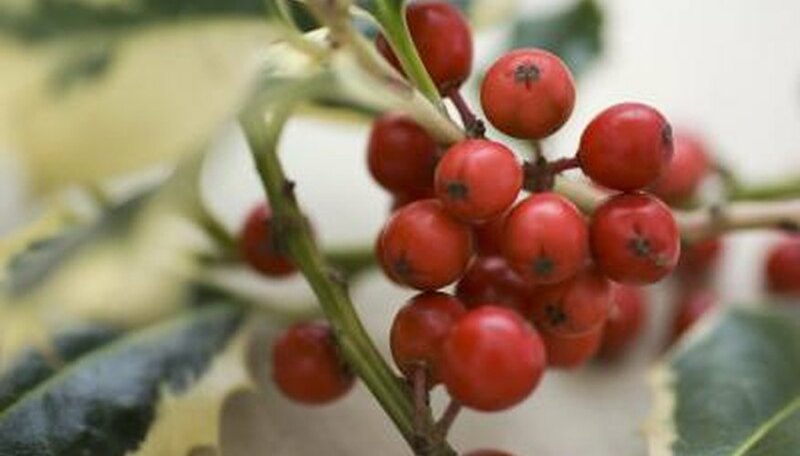 They hold added value for winter landscapes, where hollies with evergreen foliage or colorful berries sparkle against white and gray. Depending on variety, their hardiness stretches from U.S. Department of Agriculture plant hardiness zone 3 through 9. If browsing deer made a meal of your stalwart holly, take heart. Hollies respond very well to pruning -- even when done by deer. Not high on the list of deer-preferred shrubs, hollies remain susceptible to browsing when winters limit available food. Hungry deer eat plants they would normally leave alone. But deer generally don't like holly well enough to do significant damage. Your foliage should grow back fine as the plant breaks out of dormancy in spring. Even if damage is extensive, don't be discouraged. Hollies withstand heavy pruning. Some even benefit from drastic rejuvenation every year. Deer damage, while hard on your hopes for winter interest, works the same way as pruning the shrub. With the exception of pruning in late fall, most hollies handle minor pruning any time of year. Pruning promotes new growth. In autumn, that stimulation can delay dormancy and result in damage from early freezes. Winter is the perfect time for pruning holly, since the plant is dormant. It's also the time of year deer damage is most likely to occur. Take advantage of the opportunity; pick up where deer left off. Prune your holly to shape and balance its form. If Christmas is near -- or even if it's not -- bring sprigs of cut holly into your home. Fruiting branches, without or without foliage, make lovely additions to fresh or dried bouquets. Arm yourself well before pruning holly. Wear heavy clothing and gloves to protect yourself from sharp-edged holly leaves. Use bypass pruners for smaller stems and bypass lopping shears for larger branches. To prevent the spread of disease, sterilize pruning implements with household disinfectant before and after each cut. Remove branches damaged by deer by cutting back to a bud or lower branch. Branches pruned in their entirety will not return. Prune crossing or rubbing branches, and thin your shrub to promote new foliage on inner limbs. Hollies set flower buds on old wood from prior seasons. Pruning sacrifices some flowers and fruit but benefits your holly's health. With pruning complete, holly stands ready for robust spring growth. Keep the shrub well-watered as dormancy ends. This encourages new foliage and branching to replace what you and the deer pruned. Don't over-water; keep soil evenly moist. Don't apply fertilizer; recovering holly easily burns. Even after severe pruning, the holly should rebound by summer. As tender new growth appears, the chance arises that deer may return for a belated dessert. If they do, just shape the plant as necessary. Holly foliage makes a beautiful spring bouquet, too.